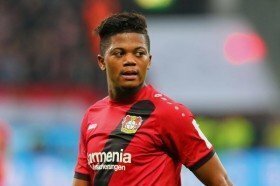 Chelsea are understood to have revived their long-term interest in Bayern Munich's Leon Bailey, according to the player's step-father and agent. The Blues were heavily linked with the Jamaica international during the summer but a move never materialised with the attacker eventually signing a five-year deal with Leverkusen. However, he has since been in-and-out of the starting lineup at the Bundesliga club and his representative Craig Butler has now indicated that the likes of Chelsea among others have made contact with him regarding the forward. "Top clubs have come forward, Real [Madrid} and Atletico Madrid, Chelsea, Roma, and in recent months they have been surprised that Leon plays so seldom, wondering why a top league player like him is suddenly sitting on the bench." he told Bild. Chelsea are currently keen on bolstering the frontline but their focus appears on recruiting a striker with Gonzalo Higuain earmarked as their prime winter target. Still, there could be the possibility of discussing a summer deal for the Jamaican with the positions of both Eden Hazard and Willian at question with their contracts expiring in 18 months' time.